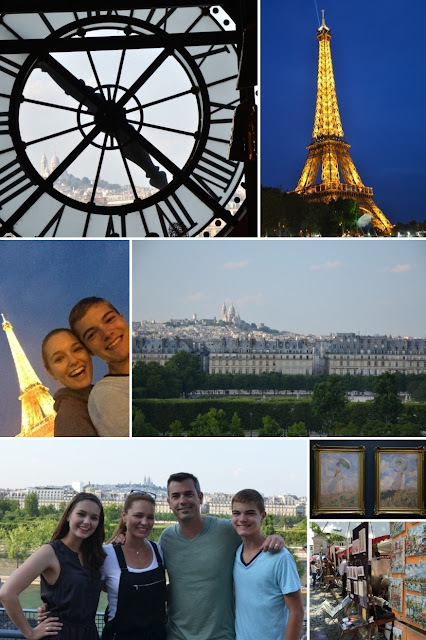 Remember a few months ago when I was dreaming about going back to Paris? Well, my dream came true! I don't think there is a place I love more than this city. 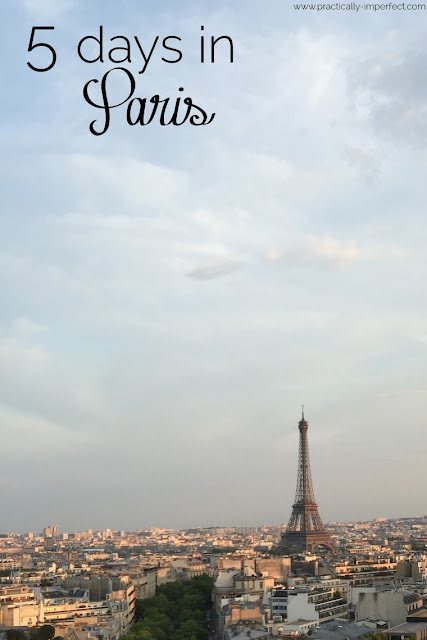 My family jam packed so many laughs, metro rides, beautiful sites, and even more beautiful memories into our five days in Paris, and I am so excited to share them! We arrived late in the afternoon on Sunday, and my brother and I explored our neighborhood in search of crepes. We managed to get so lost, but thanks so a nice florist (who also gave us the prettiest fresh peonies! ), we found a crepe stand! Could there be a more perfect way to kick off our time in Paris? To start our first full day in Paris, we headed to the Notre Dame Cathedral. After taking in the beautiful sights, we decided to go walk around Luxembourg Gardens. Wow. What a perfect, flowery place in the middle of the city! We found a sunny spot to sit and may have fallen asleep for a few minutes. 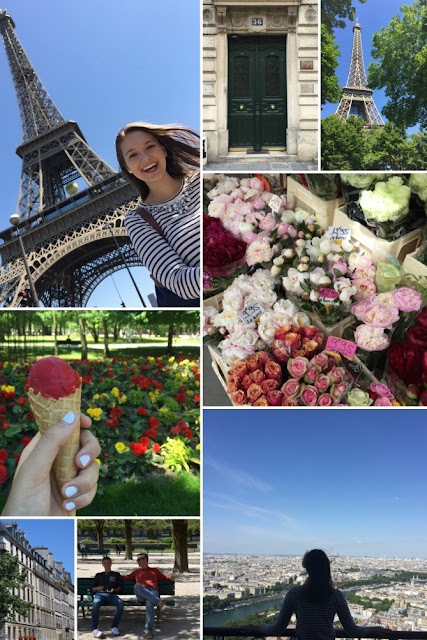 A little ice cream break woke us up, and we made our way to the Eiffel Tower. When you first get a glimpse, you can't help but stand in awe for a minute. Somehow this giant metal structure is absolutely beautiful. We braved the crowds, pickpockets, and crazy wind to go to the top and witness the most magical views of the Paris. It was a beautiful, sunny, and busy first day in my favorite city. We ventured out of Paris for the day and made our way to Giverny to see Monet's Garden! We decided to use Fat Tire Bike Tours which was amazing. The tour included the train ride to Giverny, a picnic, a beautiful bike ride through the French countryside, a tour of Monet's Garden, and the ride back to Paris. 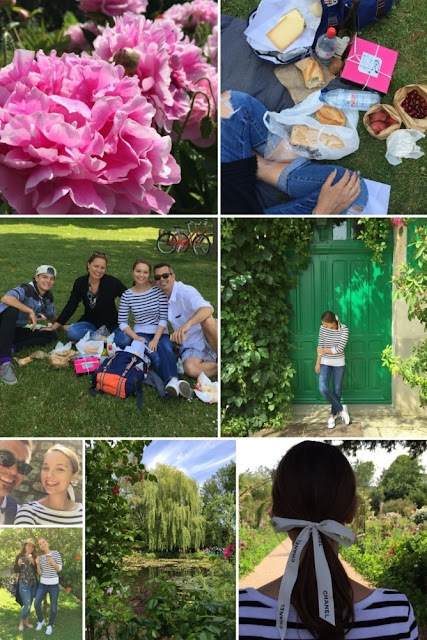 Our day in Giverny was one of my favorite memories from our trip two years ago, and this time was no different. I can't even describe how delicious our little picnic on the riverbank of the Seine was, how beautiful Monet's Garden was, or how awesome our tour guide was! On our fourth day, my dad and brother headed to La Mans to watch the car races while my mom and I headed to our favorite part of Paris! Le Marais is so quintessentially Paris, has the cutest cafes, and the best shopping in my opinion. The best purchase of the day was definitely a vintage Louis Vuitton tote that I seriously plan on using every day for the rest of my life! When I saw it tucked on a shelf I was so excited, and then when I saw the price tag I got really excited. Apparently designer labels are way more affordable in Paris than in the states...yay! Later that day, my mom and I met with Shannon! We met on the Champs Elysees for dinner, macarons from Ladurée, and a climb to the top of the Arc de Triomphe. None of us had ever been to the top, and it was incredible! 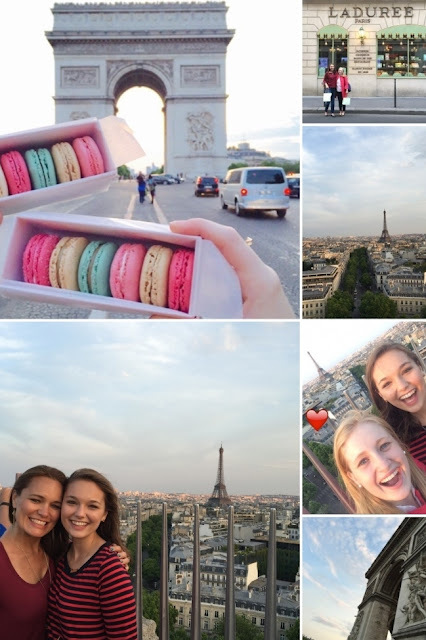 We ended the day with amazing views of Paris, yummy macarons, and a gorgeous sunset with great people. I couldn't ask for more! We started our last day with a perfect almond-choclate croissant from Boulangerie Julien (my favorite bakery in Paris!) before heading to Montmartre. This part of Paris is so beautiful, so unique, and home to the Moulin Rouge and Sacré Coeur. My absolute favorite part of Montmartre, though, is the square where literally hundreds of artists set up with their easels to paint and sell their work. I can't think of a more perfect souvenir to take home than a little canvas from Montmartre. After that, we took the Metro to Musée d'Orsay. It was incredible to see such beautiful pieces of art and honestly just as wonderful to escape the heat for a bit! We ended our day with a river cruise along the Siene. The bank of the river at sunset is so beautiful. It felt like the whole city had found a spot along the river to picnic and celebrate the night. There could not have been a better ending to our five days in the City of Light.